The Clarets haven’t ruled out bringing in signings from abroad during this transfer window. Burnley recently became the first club since Blackpool in 2011 to field an entirely British side in the Premier League - although manager Sean Dyche has pointed out that was not by design, but merely the scope of the club’s scouting network. 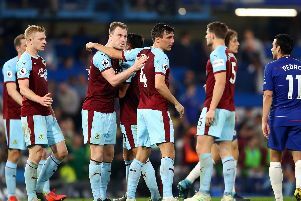 However, having appointed former Manchester United and Everton scout Robbie Cooke as UK and International Scout in November, Burnley have broadened their horizons, and Chief Executive Lee Hoos said: “Some of the players we are in for include overseas players - our plans don’t preclude them. “It’s about the right type, rather than where they come from. “It takes time for the new scouting network to work things through the system, but we are looking at players from abroad. “Due diligence is tougher, as it’s okay knowing what a player is like on the pitch, but not as easy off the pitch, and you have to know everything about players, how they interact with teammates - it only takes one bad apple. With just over a week to go until the deadline passes, at 11 p.m. on February 2nd, Burnley are out to add to their permanent capture of Michael Keane from Manchester United, and Hoos added: “We have a few irons in the fire, one or two we’d like to get over the line before the end of the window. “Hopefully it won’t go to the wire, but it seems to be how things work out!